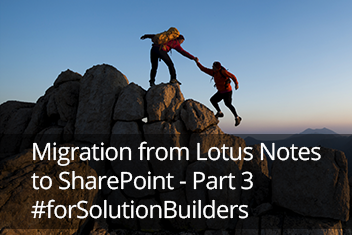 Migration from Lotus Notes to SharePoint - easy with skybow - Part 3. In the first two chapters I introduced you into the development of a "Request for leave" solution and began to show you how it can be easily migrated from Lotus Notes. Here we talked about "Data Modelling" and the "User Interface". Today I want to discuss with you the next step - Data Processing. Once the data has been entered, the next step is processing. With skybow Solution Accelerators, this is done through actions, stages, and expressions. To get back to our “Request for leave” solution: after the request has been entered, a few things need to happen. An email must be sent to the superior, informing her about a new request for leave. If, by some chance, the superior has not processed the request, a summary mail with all pending requests will be sent as a reminder the following Monday. Once the superior indicates initial approval of the request, there might be an additional check – preferably automated – to ensure that not more than a certain number of people from the same department can take a leave at the same time. After that, it all has to go to the HR department for further processing. If all this is not enough, a web service can be called, or a PowerShell script can be executed. If even that is not enough, custom code can be plugged in. Actions are driven by powerful skybow Expression Language, which enables all kinds of data manipulation. This way, practically every imaginable processing is possible with that data. Besides link actions, there are also conditional actions, and scheduled actions. Conditional actions are executed if something happens in your solution – like sending that email to the superior after the request for leave has been submitted. Scheduled actions are performed in exact time intervals – like sending that summary leave request report every Monday. By combining those three types of actions, and expressions that can be used within these actions, a powerful clockwork of background data processing is achieved, which enables enterprises to build truly powerful solutions. Based on the conditions mentioned above, there is something we call “stages.” Stages are visual representations of the current state of the process, which helps users to identify what to do next. Throughout the different stages of this “Request for Leave” solution, we will want to show the current status of the request to the user.